The Art Outreach Gallery in the Eastwood Mall, Niles, Ohio proudly announces the 5th Annual Holiday Art Show and Sale! The show runs from Friday, November 26 through Sunday, January 2, 2011. All creative persons have the opportunity to exhibit. Artists receive 100% of sale. The Gallery Show Committee requests all participating artists to volunteer a minimum of 2 gallery sitting shifts OR conduct an artist workshop OR assist in hanging the show. The Gallery operates through volunteer assistance, please consider sharing some of your time. The Art Outreach Gallery’s mission is to provide opportunities for the presentation of arts to the community, bringing together youth and adult artists with its patrons through a collaborative volunteer effort, making art accessible to the people in a nontraditional venue while promoting a life long appreciation, through public awareness, and encouraging continuing education of the vast array of the arts. The Gallery is an art appreciation initiative and community development project. The gallery is an effort to reach new audiences through public art exhibitions. The Gallery will feature various performances, activities and workshops throughout the Exhibition. The Gallery operates through volunteer assistance, if you would like to participate in helping assist with gallery sitting, or provide other volunteer services, contact Gail Stark at 330.394.3384. Please consider sharing some of your time at this amazing creative venue. Holiday hours of operation are Friday 5:00pm to 9:00pm, Saturday 1:00pm to 9:00pm, and Sunday 1:00pm to 5:00pm. All exhibits and performances are free and open to the public. 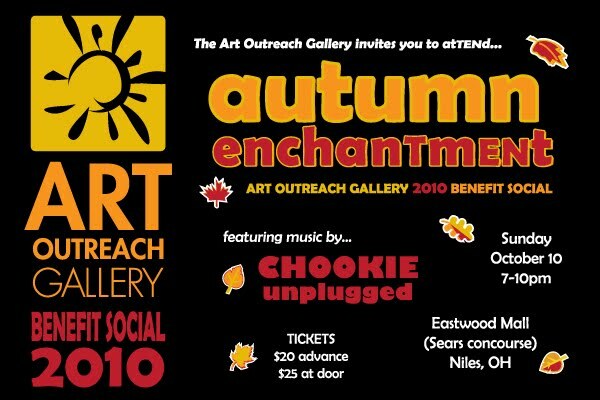 The Art Outreach Gallery invites one and all to join us at Autumn Enchantment, our 2010 benefit social! Tickets may be purchased in the Eastwood Mall at the Art Outreach Gallery (limited hours) and at the Gallery's NEW next-door mall neighbor, Daffin's Candies. Dine at Applebee's and help support the Gallery! Applebee's will donate 10% of your bill to the Art Outreach Gallery when you dine at the Niles restaurant in the Eastwood Mall Complex on all WEDNESDAYs and THURSDAYs in July and August 2010. Just present a "Dine to Donate" flyer to your Applebee's server to make a donation. As always, THANKS FOR YOUR SUPPORT and HAPPY DINING! Summer Workshops are filling up--REGISTER NOW! R-E-M-I-N-D-E-R: Summer workshop class sizes are limited--so be sure to sign up soon! --"Art:Painting" workshop # 20 Tue. June 22, Thur. June 24, 10:30am to 12:00pm is FILLED. --"Art:Painting" workshop # 21 Tue. June 29, Thur. July 1, 10:30am to 12:00pm is FILLED. --"Acting for Kids" workshop #28 Wed. July 14, 11:00am to 12:00pm is FILLED. --"Acting for Kids" workshop #29 Wed. July 21, 11:00am to 12:00pm is FILLED. -- "Robot Shop" workshop #32 Wed. July 21, Thurs. July 22 , 2:00pm to 4:00pm is FILLED. Sorry, but we are not accepting new registrations for the above workshops. THANK YOU FOR YOUR INTEREST IN ART OUTREACH GALLERY YOUTH SUMMER WORKSHOP AND PLEASE BE SURE TO WATCH THIS SPACE FOR FURTHER NOTICES AND UPDATES. The Art Outreach Gallery is expanding its summer workshops and children’s programs this year. Due to the overwhelming response and success of our youth art programs, additional youth classes have been added to the schedule from June 21 to July 31 at the Art Outreach Gallery in the Eastwood Mall. 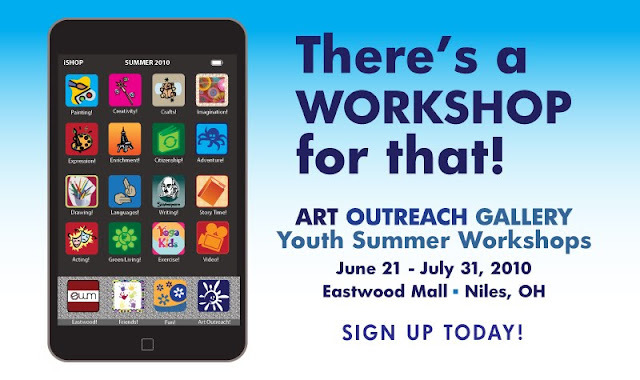 We invite area youth to participate in the 2010 Summer Workshops; an education program sponsored by Community Foundations and the Eastwood Mall Complex in Niles, Ohio. Eighty-six workshops are scheduled including Yoga for Kids, Language classes including French and Italian, Story Telling featuring Scrappy, Making Recycled Paper Class and Film Making, in addition to creative art making, acting classes and the “Blight to Light” class. Workshops are designed for students 3 to 18 years of age. Area art educators and art education students from Kent State University, Youngstown State University, Lakeland Community College, Tri C Cuyahoga Community College, Trumbull Career and Technical Center (TCTC) and Edinboro University of Pennsylvania will conduct the workshops. Due to the generous donation from local foundations, Office Max, Sherwin Williams, TCTC and community volunteers, the students will enter the classes with only a donation of a non-perishable food item to Second Harvest Food Bank. The Galley Committee feels it is important to give all students an opportunity to participate in the summer workshops while teaching children the importance of giving back to the community. The Gallery is seeking donations of art supplies such as watercolor and acrylic paints, paint brushes, drawing paper, markers, crayons, pencils, ink and colored pencils. Space and supplies are limited. Students must register to enter the classes. Workshop schedules and registration forms can be picked up at the Art Outreach Gallery or the Eastwood Mall Customer Service Center. Please RSVP by completing the required registration form and drop it off at the Gallery, the Eastwood Mall Customer Service Center or fax to (330)544-5929.For more information, please contact the Eastwood Mall office at (330)652-6980 or Gail Stark at (330)219-7833 for more information. For National Poetry Month, April 2010 Pig Iron Literary and Arts Works of Youngstown, Ohio and the Art Outreach Gallery in the Eastwood Mall in Niles, Ohio is sponsoring a Poetry Contest. Any poet or aspiring poet in the Mahoning Valley is eligible to enter. Ten winning poems will be selected. To enter type poem (line limit is 35 lines) on white, 8.5 x 11 inch paper, limit one poem per contestant. Enter by mail to Contest, Pig Iron Press, P.O. Box 237, Youngstown Ohio 44501 or deliver to 26 North Phelps Street, Youngstown Ohio (330-747-6932). Deadline is Monday, March 29, 2010 and winners will be announced Wednesday, March 31, 2010. There is no entry fee. The winning Poems will be reproduced in large format, and hung in the Art Outreach Gallery for National Poetry Month, ending April 30. The winning poems will receive a copy of the displayed poem to author and a Certificate of Prize and Exhibition. Winning poets will be invited to read their poem at the Pig Iron Literary and Art Works Second Tuesday Open Poetry Reading, April 13, to be held at the Art Outreach Gallery at 7:00 p.m. Please include Name, Age, Address, and Telephone Number with each poem. For additional information call: Contest at 330-747-6932. The Art Outreach Gallery is located across from Kitchen Collection, along the concourse between Macy’s and Sear’s. Gallery hours are Friday 5:00pm to 9:00pm, Saturday 1:00pm to 9:00pm, and Sunday 1:00pm to 5:00pm. The gallery is free and open to the public. provide other volunteer services, please contact Gail Stark at 330.394.3384. The gallery operates through volunteer assistance; please consider sharing some of your time. Thank you. On Friday, March 5, 2010, the Art Outreach Gallery at the Eastwood Mall in Niles, Ohio, will kick off National Youth Art Month with the Art Outreach Gallery’s 4th Annual School Art Exhibition featuring artwork by local kindergarten through 12th grade students. The entire gallery will feature students’ artwork from Girard School District, Niles School District, Youngstown East High School, Canfield High School, Austintown Watson and Woodside Elementary Schools. This is the first of three consecutive arts shows; each show three weekends in length exhibiting student’s artwork. The first show is from March 5 through March 21, 2010. Friday, March 19 from 6:00pm to 9:00pm – Niles School District Creative Arts Reception with music by the 8th grade band students, Niles High School Jazz Ensemble and high school student solo performances. Niles McKinley High School will hold a Junior and Senior Classes fundraiser. Saturday, March 20 from 3:00pm to 5:00pm - Local High School Open Poetry Slam hosted by Niles McKinley High School. Niles McKinley High School will hold a Junior and Senior Classes fundraiser. All receptions and performances are free and open to the public. The following art teachers are exhibiting their student’s artwork: Claudia Freeze from Washington Elementary, Lauren Peck from Niles Lincoln, Bonham and Jackson Elementary, Jon Elliott from Niles Middle, Patti Tricomi from Niles Middle, Laurie DeLucia from Niles High, Carol Rastaedt from Prospect Elementary and Girard Intermediate, Jean Rhoads from Prospect Elementary, Girard Intermediate and Girard Junior High, Jamie Williams from Girard High, Jenny Houston from Austintown Watson and Woodside Elementary, Kate Bernard from Canfield High, Kevin Hoopes from Canfield High and Lynne Rosati from Youngstown East High. The teachers are the creators of the shows. They volunteer their time to inventory, hang, and label, plan the opening receptions and pick up the students artwork. The teachers also Gallery Sit during hours of operation. If the students want to sell their artwork, the teachers are the contact person for the sales to occur. The Art Outreach Gallery board of directors thanks the teachers for their commitment and dedication of the creative development in the youth of today and community of tomorrow. This special showcase of student artwork is made possible by the partnership between the art teachers, school administrators from the participating schools, the Art Outreach Gallery and the Eastwood Mall Complex. The Art Outreach Gallery is an art appreciation initiative and community development project. Living in a “knowledge based economy” it is more important than ever to bring creativity out of everyone, and especially our children. Exposure to the arts in a public venue such as the mall provides an opportunity to experience a wide range of creative local talents and creates interest in the arts for the young. The gallery is located across from Kitchen Collection, along the concourse between Macy’s and Sear’s. Gallery hours are Friday 5:00pm to 9:00pm, Saturday 1:00pm to 9:00pm, and Sunday 1:00pm to 5:00pm. The gallery is free and open to the public. provide other volunteer services, please contact Gail Stark at 330.394.3384. The gallery operates through volunteer assistance; please consider sharing some of your time. The Gallery is responsible for keeping the lights on in the Gallery in addition to funding all programs; please consider making a donation to the Art Outreach Gallery. Mail your donation to Art Outreach Gallery, PO Box 1343, Warren, Ohio 44482. Thank you for your support in this amazing community development initiative. 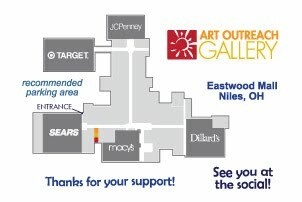 Art Outreach Gallery (AOG) in the Eastwood Mall in Niles, Ohio is getting a new look. The biggest change is the new logo showcased on the opening doors of the Gallery. The AOG, which had recently moved location in late 2009, wanted to make some changes with the new space. With the change of location came a new face to the Gallery. Chris Kasmar, a Senior Graphic Design major at Youngstown State University started as an intern for the gallery in early January. Upon arrival, Kasmar hit the ground running by first creating a new logo which would later be the face of the Gallery. Kasmar, who is also studying Art Education at YSU, aspires to be a comic book illustrator working for Marvel Comics. When asked about his future he replied, “I really want to do it all. I think teaching and graphic design will always be part of my future but my first passion will always be comics.” The Gallery Board is looking forward to utilizing Kasmar in the coming months to help with their Summer Programs for Children and Adult Education programs. Through its internship program, the Gallery hopes to offer students an exciting and challenging opportunity to gain professional skills and knowledge of the art world while they, in turn, provide the Gallery with invaluable assistance in running an ambitious arts program. Interns work intimately with board members and are encouraged to work to their strengths. They often gain valuable insights into their own interests and abilities. To apply for an internship, please submit a resume and cover letter. If applicable, please state your area of interest. If no area of interest is chosen, applicants will be reviewed according to the Gallery’s needs. Applications should be sent via mail: Art Outreach Gallery, PO Box 1343, Warren, Ohio 44482. For more information about the Art Outreach Gallery and their Summer Programs you can visit www.artoutreach.org. If you would like to participate in helping assist with gallery sitting, or provide other volunteer services, please contact Gail Stark at 330.394.3384. The gallery operates through volunteer assistance; please consider sharing some of your time. Thank you for your support in this amazing community development project.